Rated ‘PG’ for frenetic sequences of animated action violence, thematic elements, and mild language. Voices of Shameik Moore, Jake Johnson, Hailee Steinfeld, Mahershala Ali, Brian Tyree Henry, Lily Tomlin, Luna Lauren Velez, Zoë Kravitz, John Mulaney, Kimiko Glenn, Nicolas Cage, Kathryn Hahn, Liev Schreiber, Chris Pine. One of the Holy Grails of adapting a comic book to film is the idea of evoking the feeling of reading a comic while watching the story play out. 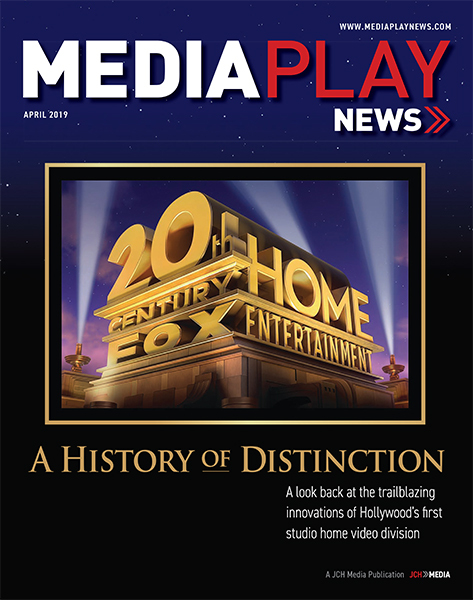 Filmmakers have tried different techniques over the years to achieve this, such as brighter colors or hyper-stylized action, to varying effect, with the best results often focusing on just telling the story in a way that brings the spirit of the work into a different medium. Animation would seem to be closer to the artistic foundations of comic books, but often present challenges of their own. Spider-Man: Into the Spider-Verse is probably the closest a movie has come to finding that sweet spot between telling a comic book story while immersing the viewer in the fantastic art that is often unique to the panel-to-panel format. Its innovative animation style, layering hand-drawn animation over CGI, combined with a thrilling story of self-discovery are just a few of the reasons Spider-Man: Into the Spider-Verse won the Oscar for Best Animated Feature at the 91st Academy Awards. The film is a deft blending of self-parody with an ambitious attempt by Sony Pictures to explore new aspects of the Spider-Man concept while the live-action version of the character is on loan to Marvel Studios. In particular, the film is an adaptation of the Miles Morales version of the character, a mixed-race teenager who gains the powers of Spider-Man in an alternate reality in which Peter Parker is killed. In the film, Miles (voiced by Shameik Moore), stumbles upon a plot by the villainous gangster Kingpin (Live Schreiber) to open a portal into alternate dimensions in search of replacement versions of his recently deceased wife and son. The plan goes awry when versions of Spider-Man from a variety of realities began to appear, and they team up to help Miles learn how to control his new powers and figure out how to return home before Kingpin’s machine damages the multiverse. The alternate versions of Spider-Man really let the creative team shine with the parody aspects of the film by introducing characters in a variety of styles. There’s a late-30s Spider-Man (Jake Johnson) who has become depressed after years of being a hero has left his personal life in shambles; there’s Spider-Gwen (Hailee Steinfeld), a teenage girl version of Spidey; there’s Spider-Man Noir (Nicolas Cage), a black-and-white private detective from the 1930s; there’s an anime version involving a little girl and her pet robot from the future; and there’s Spider-Ham (John Mulaney), essentially Porky Pig in a Spider-Man costume. The combination of the various versions offers not only some of the best laughs ever to be had with a superhero movie, but make for a terrific tribute to what has made Spider-Man such an iconic character over the years. There’s also a post-credits sequence that really takes it up a notch in that regard. It’s enough to thrill longtime fans of the character, particularly the Miles Morales version, while providing enough nods to the aspects of the mythology that most average viewers would already be familiar with so as not to need to be an avid comics reader to follow along. 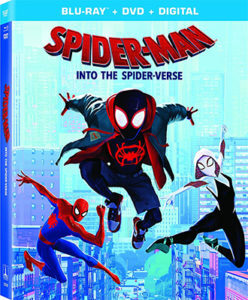 The Blu-ray is loaded with a ton of bonus material, including the new animated short “Spider-Ham: Caught in a Ham,” which serves as a prequel to the film in showing us a Spider-Ham adventure that was interrupted when he gets pulled into Miles’ reality. 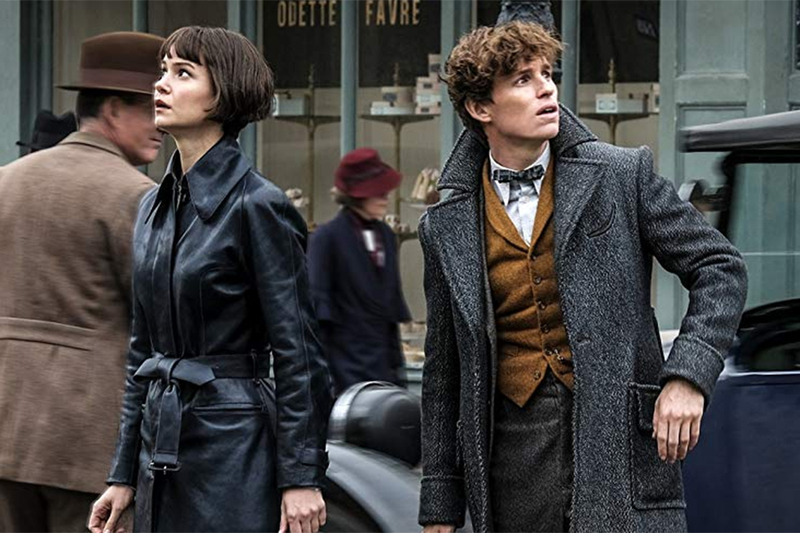 In addition, there’s an “Alternate Universe Mode” for the movie in which some scenes are replaced with storyboards of earlier concepts, as a way for the filmmakers to ponder how the film could have turned out. It runs about 26 minutes longer than the theatrical cut (which comes in at 117 minutes) and even starts with the Spider-Ham short. 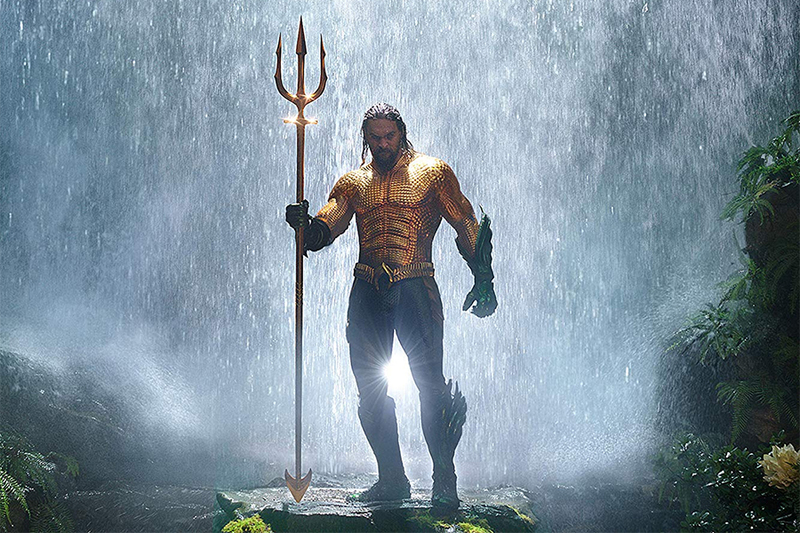 The regular version of the film includes a commentary with the filmmakers, which is a nice guide to how the various creative decisions evolved to get to the final movie, including casting decisions and the re-imagining of certain well-known characters. Many of the topics are covered in specific featurettes as well. 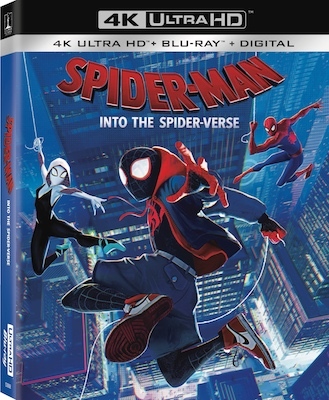 The eight-minute “We Are Spider-Man” examines the key messages of the film, while the five-minute “Spider-Verse: A New Dimension” deals with the animation style and techniques for adapting the comics. The 15-minute “The Ultimate Comics Cast” showcases the actors involved in the film and what makes them such a good fit for their characters. The two-part “Designing Cinematic Comics Characters” offers an eight-minute look at the design of the heroes, and five-minutes devoted to the creation of the villains. “The Spider-Verse Super-Fan Easter Egg Challenge” is a five-minute video that points out some of the references hidden throughout the film, while inviting viewers to look for more. There’s also the eight-and-a-half-minute “A Tribute to Stan Lee & Steve Ditko,” the co-creators of Spider-Man who both passed away in 2018. Stan Lee recorded one of his famous cameos for the film. There are also some digital-exclusive bonus featurettes. The three-minute “Another, Another Times Square” provides a primer on the concept of alternate realities, the minute-and-a-half “Meanwhile, in a Gassy Universe” is a juvenile montage of various clips from the film with dialogue replaced by fart sounds (no doubt the work of Spider-Ham). 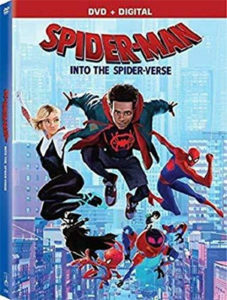 Vudu has a minute-long “An All-Star Cast” promotional video, while Movies Anywhere provides videos for how to draw Miles and Gwen, about three minutes for each character. Rated ‘PG-13’ for thematic content, language including racial epithets, smoking, some violence and suggestive material. Stars Viggo Mortensen, Mahershala Ali, Linda Cardellini, Dimiter D. Marinov, Mike Hatton, Sebastian Maniscalco, Iqbal Theba. Sometimes there is great value to be found in a straightforward story, simply told. It’s a lesson the filmmakers behind Green Book learned well, with the film taking home the Oscar for Best Picture at the recent 91st Academy Awards ceremony. The win caused somewhat of a whirlwind of criticism regarding the film’s soft-shoe approach to dealing with racism in the 1960s, but that might stem from overanalyzing the film’s intentions — it exists as a way for co-scripter Nick Vallelonga to pay tribute to his parents. 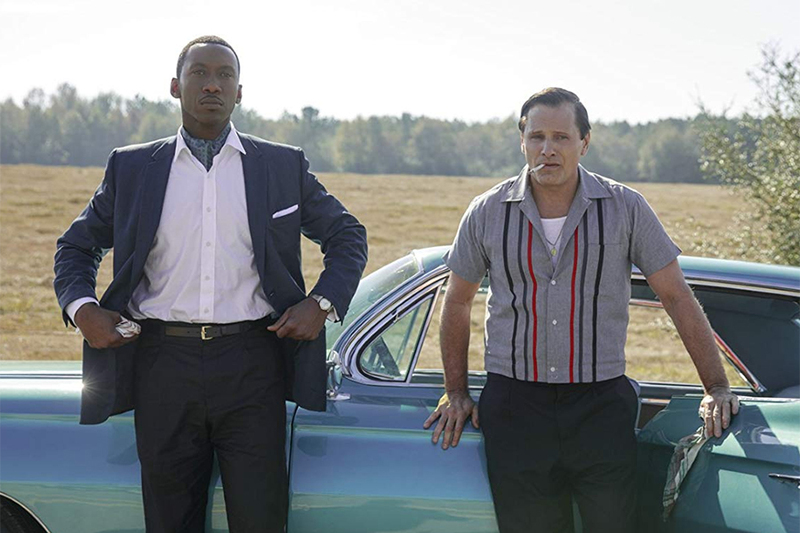 The film tells the story of Tony “Lip” Vallelonga (Viggo Mortensen), a New York club bouncer with shady connections who is hired by African-American pianist “Doc” Don Shirley (Mahershala Ali) to serve as a driver and bodyguard on a two-month concert tour of the Deep South in 1962. Given the racial attitudes prevalent at the time, they must rely on the Green Book, a guide for black travelers to find lodging, restaurants and other business that would serve them. At several stops, Doc is denied service at the very restaurants where his musical talents are being celebrated, which only goes to highlight how dumb the segregationist attitudes were on the surface of it. Doc himself is cold and aloof, and doesn’t identify with his cultural heritage. Tony is a stereotypical New York Italian thug who isn’t the most eloquent in terms of speech or thought. Along their journey they’ll learn to let go of some of the preconceptions each had about what the other represents to them. In using the road trip format, the film establishes itself as an acting showcase for its two leads, and they deliver spectacularly with mesmerizing performances and infectious chemistry. Ali’s supporting actor Oscar for the role is well deserved, while Mortensen’s multiple nominations throughout awards season speak to the quality of his work as well. Watching their interactions is the primary reason to pick up the Blu-ray, since the bonus material is rather thin, comprising just three short featurettes. First is the four-minute “Virtuoso Performances,” a look at Mortensen and Ali’s approach to their roles. Next is the five-minute “An Unforgettable Friendship,” in which the filmmakers discuss the real-life relationship between Doc and Tony, which is interesting in light of the very public disagreement the Shirley family has had with how the movie portrays it. Finally, there’s the four-and-a-half-minute “Going Beyond the Green Book,” which focuses on the significance of the book that inspired the title of the film. 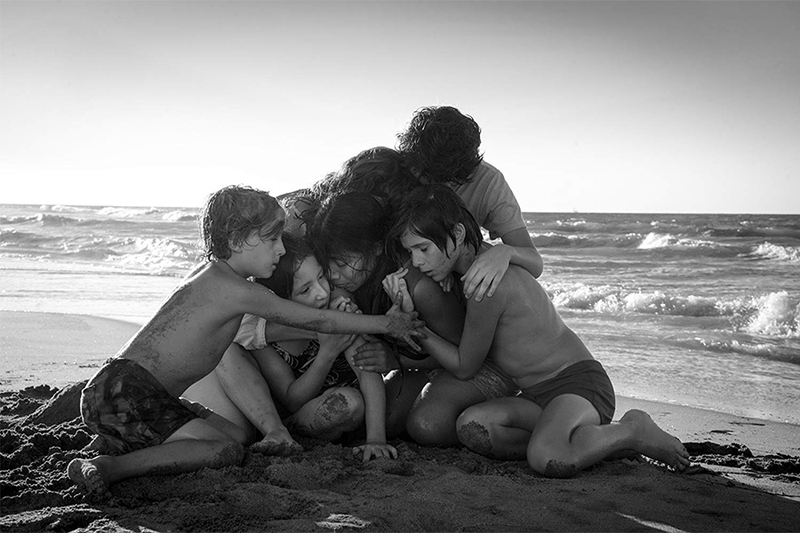 Heading into the Oscars, Netflix original movie Roma emerged the big winner at the British Academy of Film and Television Arts 2019 EE British Academy Film Awards held Feb. 10 in London. The black-and-white film won awards for Best Film, Director, Cinematography and Film Not in the English Language. Director Alfonso Cuarón won in each of these categories as well. Cuarón’s semi-autobiographical movie about growing up in Mexico has been nominated for 10 Academy Awards in the United States. Separately, Oscar nominee The Favourite was named Outstanding British Film, with Olivia Colman receiving the BAFTA for Leading Actress, Rachel Weisz taking Supporting Actress and Deborah Davis and Tony McNamara winning Original Screenplay. Sandy Powell won Costume Design, Fiona Crombie and Alice Felton won Production Design and Nadia Stacey won Make Up & Hair. Meanwhile, Rami Malik won Leading Actor playing the late Freddie Mercury in Bohemian Rhapsody; the film also won the award for Sound. Supporting Actor went to Mahershala Ali for Green Book; BlacKkKlansman won Adapted Screenplay. Spider-Man: Into the Spider-Verse took the award for Animated Film, and Documentary was won by Free Solo. Universal Pictures Home Entertainment will release Green Book through digital retailers Feb. 19, and on Blu-ray, DVD and 4K Ultra HD Blu-ray March 12. Directed by Peter Farrelly and inspired by a true story, the film stars Viggo Mortensen as Tony Lip, a bouncer from an Italian-American neighborhood in the Bronx, is hired to drive Dr. Don Shirley (Mahershala Ali), a world-class Black pianist, on a concert tour from Manhattan to the Deep South in the 1960s. Confronted with racism, they must rely on The Green Book to guide them to the few establishments that were then safe for African-Americans. The cast also includes Linda Cardellini. 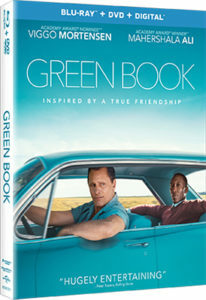 Bonus materials include a “Virtuoso Performances” featurette with Mortensen and Ali discussing their characters; the featurette “An Unforgettable Friendship,” in which the cast and filmmakers discuss the friendship between Don Shirley and Tony Lip; and the featurette “Going Beyond the Green Book,” in which filmmakers and cast discuss the significance of The Green Book.